Under assault from the misnamed Stand for Children, teachers in Massachusetts are about to give up seniority as a criterion for layoffs, and give principals greatly increased power over personnel issues. 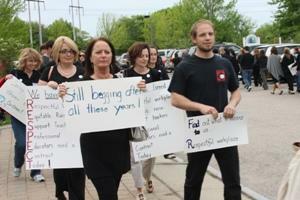 Teachers in Fall River, Massachusetts, marched in May. Photo: MTA. Under assault from the misnamed Stand for Children, teachers in Massachusetts are about to give up seniority as a criterion for layoffs, and give principals greatly increased power over personnel issues. Policy proposals started coming from the top down, instead of from local activists. Polls show those bumper-sticker slogans have lots of appeal, and they are backed by a barrage of media (and public figures) repeating the same message. Stand for Children reportedly enrolled a herd of lawyers and lobbyists, hired over a dozen organizers, and lined up $10 million to pass the referendum. With passage a likely bet, leaders of the 110,000-member Massachusetts Teachers Association, the largest teachers union in the state, approached Stand. Negotiate with us, the unelected group told the MTA, and we’ll withdraw the referendum. If there is anywhere in this country that teachers and their unions should be safe from attack, it’s Massachusetts. The state’s students have the highest test scores in the country. Every (non-charter) public school teacher is unionized. There’s a progressive African American governor, and Democrats control three-quarters of the legislature. So why is the MTA giving in without a fight? Why, after a spirited four-hour debate, did delegates to the MTA’s annual meeting vote 345-230 to let leaders negotiate away rights teachers fought for in the past? Teachers are scared, and for good reason: Billionaire “philanthropists,” politicians, and the media are lined up against them. The attack on teachers is a key piece of the larger attack on public sector unions. Union leaders also can’t remember the last time they organized to fight; their preferred strategy is cutting a backroom deal, and that’s what they recommended here. Rank-and-file opposition is gearing up, but hasn’t yet hit full stride. One teacher explained, “I’m glad we gave in; if we hadn’t, we would have been beaten much worse.” In other words, even though the compromise deal is a big step backward, it is not as damaging as the referendum. To win the battle, and the larger war, teachers and their allies would need to do some serious organizing to change the way people think about teachers. That wouldn’t be easy and there would be no guarantee of victory this November. Of course, giving in this year opens the door to new assaults year after year until the MTA begins to fight back. To listen to the media, or to Barack Obama, or Secretary of Education Arne Duncan, the biggest problem with education is lousy teachers and the unions that defend them. And pundits are right that the quality of teaching matters. It explains about 10 percent of the variation in how much children learn, which makes it the second most important factor. By far the most important factor, explaining 50 percent of the variation in how much children learn, is the family’s social and economic position. A child’s social class is five times as important as his or her teacher. If we want to improve student test scores, the most important thing we can do is create a more equal society: strengthen unions, tax the rich, fund social programs. This is not the first attack by Stand for Children, which has a national strategy. In a speech posted on YouTube, the group’s CEO Jonah Edelman explained how in Illinois, the organization lined up support from powerful politicians and lobbyists, divided the state’s NEA and AFT teachers unions from each other, used the NEA affiliate to pressure the AFT affiliate, and got the teachers to accept a deal, one where Stand for Children controlled the fine print in the law. Edelman speculates that the unions didn’t really understand what they were agreeing to. The strategy worked so well, he said, that he hoped to do the same thing in Massachusetts. And now it looks like he may well succeed: the Massachusetts NEA affiliate (MTA) has been having secret negotiations with the group, with the AFT affiliate not in the room. The Massachusetts ballot question sends the implicit message that billionaires know best, that they are more dedicated to public schools than the teachers who spend their lives there, at unimpressive salaries, working in under-resourced schools serving poor kids. So it appears that the MTA will agree to a system where layoff decisions are based on “performance” rather than seniority, and a big chunk of performance will be students’ test scores. But “performance” is a flexible category; it includes “the best interests of the students”—which could be interpreted as never standing up for the union. Rebecca Cusick, a Fall River teacher in a poverty-area school, notes: “Teachers with seniority are the only ones comfortable asking questions or disagreeing with curriculum. Without seniority, people will be less comfortable advocating for the neediest students.” Under the new system, anyone who does so will potentially be at risk. Stand for Children and its allies, like Teach for America, find seniority unimportant—they prefer graduates from elite institutions who parachute in to teach for a year or two, quit because the work is too demanding and doesn’t pay enough, and then spend the rest of their lives explaining that long-time teachers lack dedication. What these groups recommend for the poor is the opposite of what prevails in the elite prep schools their own children attend. Prep schools have far less high-stakes testing, a shorter school year, and lots of enrichment and sports. More than 100 members of her local showed up at a public forum to discuss the attacks, and EDU turned members out to the MTA board meeting where leaders sought approval for the final deal they will negotiate. The board of directors did in fact approve leaders’ actions, voting 37 to 24 last week. Now the legislature will be asked to pass, in record time, a deal negotiated between two private parties, and MTA leaders will declare victory. When layoffs loom, long-term teachers will be subject to the whim of their principals. Dan Clawson is a member of Educators for a Democratic Union and serves on the board of the MTA. This article originally appeared in “Labor Notes”. Remember the last time a millionaire (Ron Unz) manipulated voters in various states like Massachusetts to institute an “English only law” in our schools? How did that turn out? Our ELL scores are lower than ever while those schools who maintained their dual language programs are scoring at or above other gen ed schools. Is that the fault of the teachers too? Maybe we should stop listening to millionaires.